The concept of multi-account electronic credit cards, also known as smart cards or digital credit cards, have garnered much interest over the last several years. A handful of companies have entered this market, but none are currently offering cards which deliver upon this innovative, and practical, concept. Most recently, Plastc ceased operations earlier this month, and the company may be exploring Chapter 7 Bankruptcy protection. A previous competitor, Coin, was acquired by Fitbit in 2016, and subsequently shut down after the acquisition. Swyp appears to still be in operation, but the company still has a waitlist and has not officially launched its product. The only company that we identified which has actually shipped cards to customers was Stratos, which was acquired by CardLab Innovation ApS in January 2017. CardLab is no longer shipping the Stratos card however. Envision IP analyzed the US patent portfolios of Plastc, Coin, Swyp, and Stratos to determine how and to what extent these companies have protected their digital credit card technology. Coin owns five issued US patents related to multi-account payment card technology, with priority dates going back to 2010. Coin’s patents cover reducing the power consumption of digital credit cards during a swipe procedure, utilizing traditional magnetic point-of-sale card readers with “use once” numbers from electronic cards, and data encryption for digital credit cards. Stratos has four issued US patents and a pending US patent application in this field, with priority dates going back to 2012. 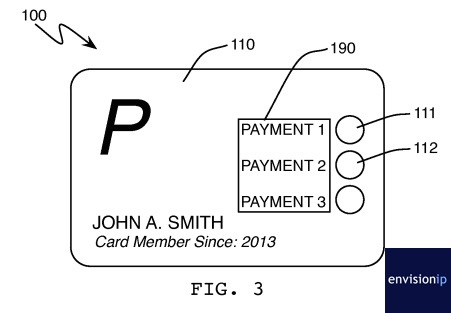 The patents cover wirelessly controlling a re-programmable payment card using a mobile device, displaying multiple payment account identifiers on a display on an electronic card (as shown in Fig. 3 of US 9,286,561 below), methods of selecting and transmitting a particular payment account number during a transaction, and controlling a magnetic strip emulator within an electronic card. Qvivr, Inc., the parent company of Swyp, owns 2 pending, published US patent applications in this field. 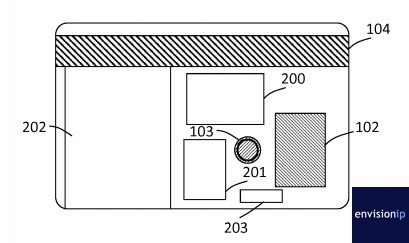 The Swyp patent applications cover the construction of a multi-layered electronic card with a solenoid coil, display, buttons, wireless system, and a processor, as shown in Fig. 5 of US 20160224879 below), back-end server architecture for processing payments using its electronic card with traditional credit card payment processors, and a system to generate a magnetic field using a card-embedded solenoid coil. We did not identify any US patents or published, pending US patent applications assigned to Plastc. Based our analysis of these specific companies, Coin (Fitbit) and Stratos (CardLab) appear to own very relevant patents related to various aspects of digital credit cards. These companies have issued patents generally covering many of the aspects that Qvivr has filed patent applications for. It will be interesting to see how the Coin and Stratos play into the prosecution of the Stratos patents. 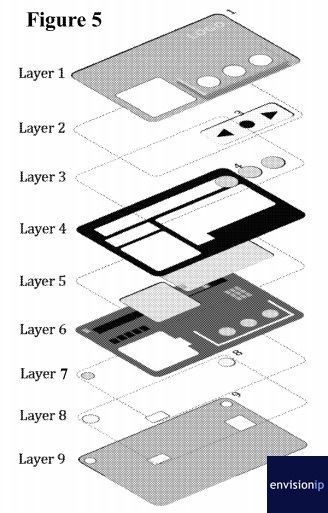 Ultimately, however, with the earliest priority date of 2010 among the group, there may be relevant pre-existing patents related to credit card magnetic strip emulation, multi-account payment systems using mobile devices, programmable single use cards, and the like, which may serve as prior art to companies operating in this space. For comparison, the mobile payments industry as a whole has heavily patented its technology, with some patents having priority dates in the late 1990s. The space has patents from various types of organizations, such as technology giants IBM, Apple, Google, and Samsung, payment technology companies Square, PayPal and Boku, financial institutions Mastercard, Visa, Capital One, American Express, Bank of America, and Visa, telecommunications providers AT&T and Verizon, and retailers such as eBay and Walmart. The mobile payments industry as a whole has over 2,500 US patents alone. With the continuing evolution of smartphones and payment integration, the future of a physical digital credit card may be bleak. For instance, Fitbit may eventually plan to integrate multi-account payment technology within its wearable device platform, and companies such as Apple and Google have already made significant headway with their own proprietary Apple Pay and Android Pay systems that utilize user devices. While the concept appears very practical, implementation has certainly been a challenge for the companies we analyzed. Aside from efforts of the early pioneers Coin and Stratos, there does not appear to be a heavy focus on patenting in the digital credit card space currently. This may indicate that the technology as a whole is something that may become obsolete before ever becoming mainstream.